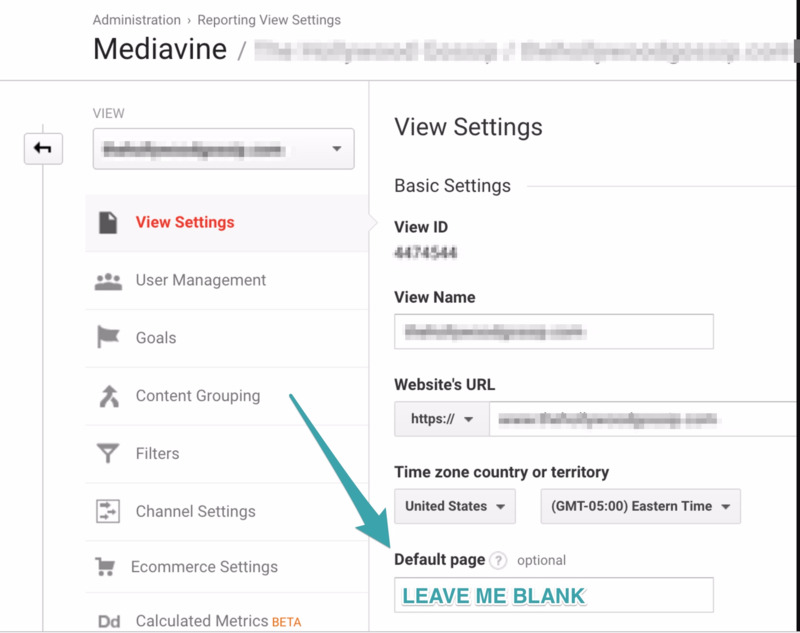 Are the top pages in your dashboard appending your url onto the end? Find the fix here! If you are seeing your dashboard top pages section appending your base URL to the end of the link, you have your analytics configured incorrectly. Thankfully, the fix is very simple. Just login to your Analytics and go to your "View Settings". Look for the Default Page section, and remove your URL from that field. Once you have done that, check your dashboard 1-2 days later. The dashboard updates every day at 10 a.m. EST. After the change has been in effect for a full day, narrow down your dashboard dates to show only the previous day (e.g. 1/2/17 to 1/2/17). You should see that the URLs have been updated for the time since the change. Making this change won't affect the history of your data in your dashboard, but will update your URLs moving forward. If you have questions, you can contact us via the blue help bubble in the lower right corner of your screen, or at publishers@mediavine.com.